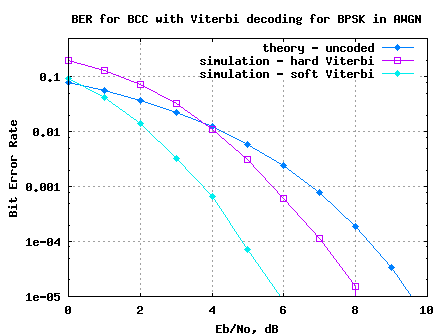 In the post on Viterbi decoder  and soft input Viterbi decoder , we discussed a convolutional encoding scheme with rate 1/2, constraint length and having generator polynomial and having generator polynomial . If the number of uncoded bits is , then the number of coded bits at the output of the convolutional encoder is . 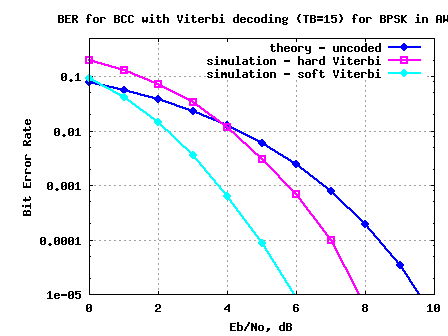 Decoding the convolutionaly encoded bits by Viterbi algorithm consisted of the following steps. 2. For each of the states, compute the path metric knowing the following. Each state can be reached from only two previous states (out of the 4 possible states). 3. Store the survivor predecessor state for each state. 4. 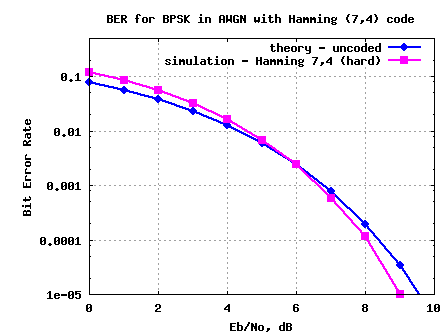 Once we have processed received bits, we know that the convolution encoder has reached state 00. We start traceback from state 00, and given that we know the current and previous state, the input bits can be decoded. However, when the number of input uncoded bits is large, the memory requirements for a survivor state matrix of dimension becomes impossible to manage. At time instant , we start the traceback and continue tracing back through the survivor path times. Once we are done with the traceback, we start estimating the decoded bits knowing the current state and previous state. 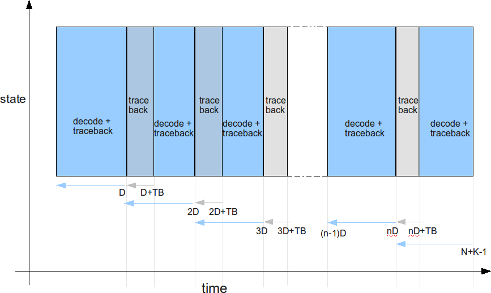 Similarly, we again start the traceback at time , do traceback times and then decode bits from to . 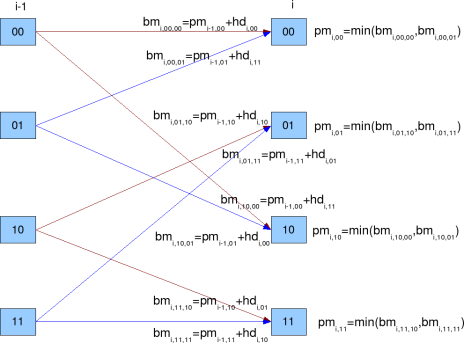 Once we reach the end of the input sequence at time instance , we know that trellis has converged to state00 and then we do demodulation with traceback. Given that traceback speed is equal to storing the speed incoming coded bits, we can implement the above algorithm with a memory of . Note: The literature of different architectures for survivor state management is vast and is not explored in this post. 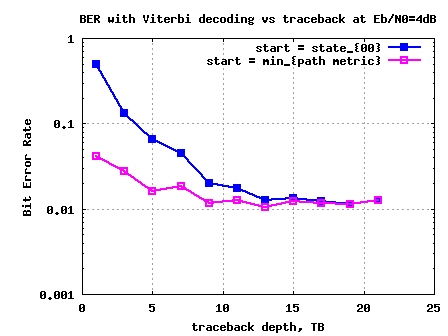 From simulations it has been observed that doing traceback depth of around 15 ensures that the obtained BER with finite survivor state memory is close to the BER with infinite survivor state memory. Note that corresponds to around 5 times the constraint length of . Additionally, as expected starting traceback with from the state with minimum pathmetric shows better performance than always starting at state 00. Warning: This simulation took around 10hrs to complete. Am thinking that I will move to C code for simulations involving lots of for-loops.